Settlement at the lower end of the fen stream Rotte dates from at least 900. Around 1150, large floods in the area ended development, leading to the construction of protective dikes and dams. A dam on the Rotte or ‘Rotterdam’ was built in the 1260s and was located at the present-day Hoogstraat (‘High Street’). Although Rotterdam did well after the middle ages and in the ‘Golden Century’ – roughly between 1650 and 1750) it was not before the second part of the nineteenth century that the city started to develop itself rapidly. Helped by the digging of a new seaway (The Nieuwe Waterweg) Rotterdam was rid of acces problems caused by the silting of the river and started receiving ever bigger ships with cargo for/from the booming Ruhrgebiet in Germany. Port related trade and industry skyrocketed, and the city started to draw lots of migrants from the then poor Brabant province, for whom the southern part of the city was constructed. 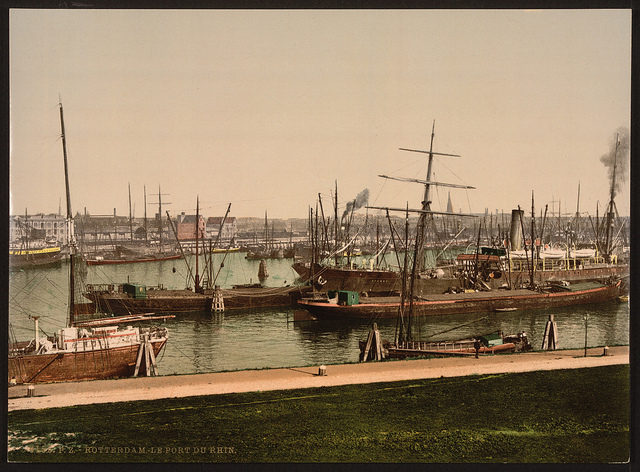 At the turn of the twentieth century Rotterdam was well under way to become the largest economic centre in The Netherlands. It was between then and the second world war that large prestigious construction works were undertaken, in part to show off the new found economic pride. The German army invaded the Netherlands on 10 May 1940. Germany had planned to conquer the country in one day, but after meeting unexpectedly fierce resistance, it finally forced the Dutch army to capitulate on 14 May 1940 by bombing Rotterdam and threatening to bomb other cities. The heart of the city was almost completely destroyed by the German Luftwaffe, and 800 people were killed, while about 80,000 others were made homeless. During the war, Rotterdam was bombed several times during allied raids that were aimed at the harbour area but sometimes also hit the city. The City Hall survived the bombing. Unlike most other European cities however, the City Council did not aim at rebuilding what was lost, but on taking the opportunity to create a ‘new’ and better city. Damaged but not destroyed old buildings were torn down in the process. From the 1950s through the 1970s, the city was rebuilt. It remained quite windy and open until the city councils began developing an active architectural policy from the 1980s onwards. Daring and new styles of apartments, office buildings and recreation facilities resulted in a more ‘liveable’ city centre with a new skyline. In the 1990s, the Kop van Zuid was built on the south bank of the river as a new business centre.